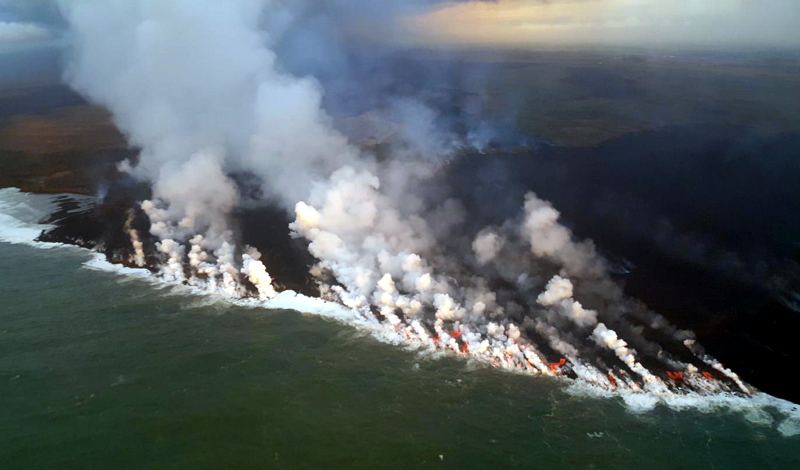 Several lobes of Fissure 8 lava from Kilauea were entering the ocean along a broad front, with the southwestern edge of the entry shown here on July 18. The explosion that sent solid and semi-solid volcanic rock through the roof of a tour boat and injured 23 people who were on a cruise in Hawaii might have occurred underwater as a hydrovolcanic reaction. [post_ads]The early-morning tour went out on July 16 to see the point where the lava from Kilauea is entering the ocean. But the tour was cut short when a lava bomb punctured the roof, and volcanic rock and ash rained down on the boat and its passengers. Of those on board, 23 were injured—one seriously with a broken leg—and others suffered burns and cuts from the explosion. Hydrovolcanic explosions are caused by the interaction between the hot magma and water—in the case of Kilauea, ocean water. “The detailed cause of the explosion is uncertain, but we are fairly certain that it resulted from the heating of seawater by molten lava,” said a blog post from the United States Geological Survey. These types of explosions were observed in the 1960s when a fisherman saw magma breaching the surface of the water ahead of his boat and creating a plume of black rock from a volcanic event below the surface of the water, according to the USGS. The plume was coming from a volcanic vent on the ocean’s floor, it was only when the activity became strong that the rock plume made it above the surface of the water. Hydrovolcanic explosions are not as deeply understood as those volcanic eruptions that occur without the interaction of water. This has led to more debate over exactly what happens and how it happens when it comes to these events. But the Kilauea hydrovolcanic explosions are some of the most observed ever, so they might lead to more or new knowledge about such explosions. Tours around the island are no longer allowed to get as close to the ocean entry point, where more hydrovolcanic explosions are possible. Some of the reactions between magma and water are milder than the one that rained down on the boat tour, but the potential for danger prompted the new rules. Kilauea’s explosions are smaller and less violent than those fed by underwater vents on the ocean floor because Kilauea is fed by flows entering at the surface of the water for the most part. More explosions similar to the July 16 event are possible, and “last week's explosions suggest that tubes lie below the waves at the current ocean entry,” according to the USGS. A small island that's formed off the edge of the ocean entry point also suggests that some of the lava could be entering the ocean from a spot other than the surface.